The 69th District Development Committee (DDC) meeting of Udalguri district was held simultaneously with a training programme of Assam Right to Public Services Act (ARTCPS) at the conference hall of the DC office at Udalguri on Saturday. The DDC meet, presided over by the Additional Principal Secretary of BTC, Robinson Mocharari, was attended by Additional Deputy Commissioner, Udalguri Bhaskarjyoti Manta, and officers of all the departments of Udalguri district. Mocharari ordered the Public Health Engineering Department to complete the constructions work both in Udalguri and Bhergaon block at the earliest. toilets and other infrastructure necessities. ADC Manta suggested for a convergence meeting before initiating the portion abhiyan which included themes like breast-feeding, complementary feeding, girls’ education, etc. Additional Principal Secretary asked the other departments like Sericulture, Agriculture and Fishery to boost their cultivation and increase their productivity. He informed that under the Agriculture Department, Chief Minister Samagra Gamyan Yojana, one tractor will be distributed to every revenue village with 70% subsidy in which 447 tractors will be distributed out of which 50 have already been distributed. As a part of the scheme, rice, wheat gram, saplings, composed vermicompost, saplings were also distributed among the villagers. 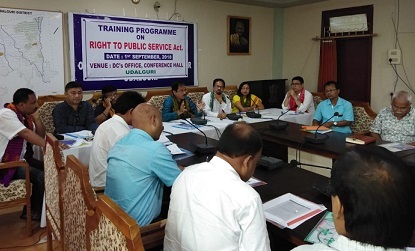 The training programme of Assam Right to Public Services Act (ARTCPS), presided over by the DC Udalguri, Dilip Kumar Das, was also also attended by Joint Secretary, Jatin Bora, ADC Bhaskarjyoti Manta, Additional Principal Secretary, Robinson Mocharari. The officers of different departments of Udalguri district received first-hand training by senior adviser Fakharuddin Ahmed. The training programme was aimed to making the officers aware of the new policy which deals to create an integrated platform for all citizens to get digital services by online application for any type of public services which will be a reliable mode of serving the people. The online public services will be operational within a stipulated time.